Is Anesthesia Dangerous for Cats with Cerebellar Hypoplasia? Thankfully, it’s something that we don’t need to think about often, but when we do, it can be a serious concern for CH cat parents. Since our cats already have a certain degree of brain damage, will the anesthesia cause more damage? Can CH cats even handle anesthesia? According to Cary, a veterinary anesthesiologist who has written about this on the CH Kitty Club’s Tips from Members page, there are no medical contraindications (conditions that make a procedure inadvisable) to any anesthetic technique for cerebellar hypoplasia cases. What does that mean in plain English? CH cats can be anesthetized. In fact, he said that if it’s for a standard procedure, like a spay or neuter, it shouldn’t be an issue. Of course all operations come with a certain degree of risk. Fortunately, the odds of something happening to a healthy cat is pretty low. Cary said the percentage of healthy cats that die while under anesthesia is only 0.3%. However, that percentage increases if the cat is sick while being anesthetized. And while we’ve all heard our share of anesthesia horror stories, your kitty doesn’t have to become one. You can improve your odds by having and experienced, competent vet perform the procedure. A vet who routinely monitors blood pressure. This will tell them if there’s a lack of oxygen reaching the brain, which could result in more brain damage. In addition, don’t forget to let the vet know about your cat’s cerebellar hypoplasia. It’s tremendously important for your vet and their staff to be aware of any pet’s brain disorder when performing a medical procedure. If you’re still concerned, have a serious talk with your vet about the procedure and your worries. A good vet will be happy to address all of your concerns. Another idea would be to speak the vet or shelter that sterilized your cat prior to adoption. If your cat had to be anesthetized for that procedure — and obviously came through OK — they may be some folks you’ll want to consult with, too. I realize that this is simply the tip of the iceberg on this topic, but I wanted to get the conversation started. Are there any other vet techs out there who have experience with CH cats and anesthesia? 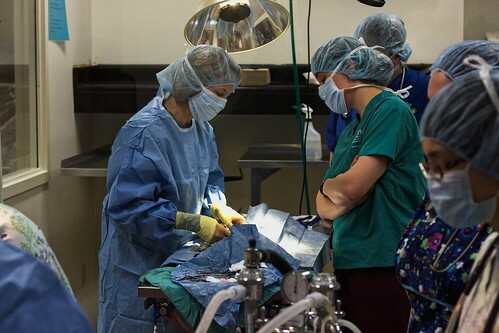 Has your cat had a surgery that required anesthesia? How did the procedure go? Please share in the comments. Buster just had surgery about 3 weeks ago for bladder stones..I was terrified about the anesthesia, but my vet was terrific; she called the surgeon and explained my fears, and even spoke to the neurologist and anesthesist..The consensus was that in an otherwise healthy cat, the anesthesia shouldn’t pose any more of a risk than normal..They explained that since CH is non-progressive there really aren’t any contraindications, and yes,.Buster came through with flying colors! The one thing I did insist on was 24 hour care so his vitals could be monitored overnite; so an animal hospital performed the surgery as my local vet did not have overnite coverage..so although I don’t ever want to go through this again, it all worked out fine! I’m a CVT in Tempe, AZ at an 11 doctor practice. I recently adopted a stray kitten with CH that was found in our parking lot. I asked every doctor there if they thought he was healthy enough for a neuter/declaw surgery, everyone agreed he was. His blood work and urine were both normal. While under anesthesia, he did perfectly! He was very consistent with his heart rate, blood pressure, breathing, temperature, and his SP02 was 98-99 throughout the whole procedure. After surgery, he seemed to recover very well, until later on that night when I gave him his pain medication. We gave the dose of oral buprenorphine, and about 5 minutes after he started becoming very vestibular, very freaked out, and “ketamine-like.” He was head-bobbing, disoriented, couldn’t stand let alone walk, and was rolling around. I called the doctor who did the surgery–he was baffled. I took him to work the next morning so a doctor could evaluate him. He was slightly better, but still disoriented and unable to stand. One of the veterinarians I work with said he has seen some cats get “vestibular” post anesthesia and one that lasted for 3 days. He had surgery on Monday, and its Thursday and he is still head-bobbing, dizzy, and trying to walk but is rolling around. He is definitely better than the first night, but still not back to “normal.” Prior to surgery, he showed very mild signs of CH–he would walk/run with mild wobbling, he wasn’t ever dizzy or disoriented, and he could jump into a litterbox and play with the other cats easily. I’m wondering if anyone else has had this reaction with their CH kitty post anesthesia or post pain medication. I’m worried he’ll never get back to his normal state, and he’ll be this vestibular for the rest of his life. The doctors I work with are all split in their predictions–half think he’ll recover and just needs time to get any residual drugs out of his system, and the other half think he may stay this way. Does anyone have any more experience with this? Wow! I’m so sorry to hear about your experience! I’m glad to hear he’s starting to get better, but that’s super scary. If you’d like, I could put up a post about your experience. Hopefully more folks will see it and respond to it. How does that sound?
. May I say it was very ill-advised to de-claw a cat with CH, as they rely on their claws far more than other cats. My moderate CH cat can go up and down stairs safely, but he relies on his claws to get a good grip on the carpet. The US is one of the very few developed countries where de-clawing is legal – in most of the rest of the developed world (including the UK, Europe, Australia and New Zealand) it is regarded as mutilation and is illegal except in medically exceptional circumstances. I was a surgical tech for two different large shelters for a good part of my career. Whenever we had any cat for whom anesthesia might be a risk we just got out the fish tank and cranked up the iso. Once the cat fell over in the tank we pulled it out and went to a mask. Intubating increased the time under anesthesia so we didn’t intubate for spay or neuter, just did the procedure as quickly as possible and let the cat wake up. Gas anesthesia is great because it is excreted primarily through the lungs, so a few breaths of room air would have Fluffy walking and talking again. I love special needs cats, and this method even worked beautifully on my two liver shunt kitties, for whom most injectable anesthesia would be a death sentence. I have a 2.5 year old CH cat. I rescued the mother and she gave birth to two kittens three weeks later. Only one has CH and because I believed Timmy was a male I chose not to spay to avoid any surgery complications. I spayed her sister and thought nothing more about it until Timmy turned 7months old and went into her first heat cycle. A cat in heat is annoying at best but I still worried about the risks of surgery with CH so I have been trying to cope but she has started spraying all over the house! I am now trying to find a vet that will spay her and I wanted to say thank you for the info, I am now armed with the questions I need to find a capable vet. I was hoping to find out if Lesley’s cat ended up fully recovering? Does anyone happen to know? Sorry for such a late response. Yes, Burton is doing great! I contacted a vet neurologist after his procedure. He believed Burton had an infection going on in his brain which made him have such a bad reaction to the anesthetic. After about 3-4 weeks of medication post op, he slowly returned back to “normal” and is now as happy as ever. Couldn’t be more pleased with my vet and how hard he worked to help me figure out what was going on with him. I admit, I’m a little afraid to put him under again, but I work at a vet dental specialty hospital and we frequently have a vet anesthesiologist come in for high risk cases. She would make me feel very comfortable putting him under. Hope this helps, and again I apologize for the late response!!! Idiot. CH cats have major reactions to ketamine. Any anesthesia is NOT ok.